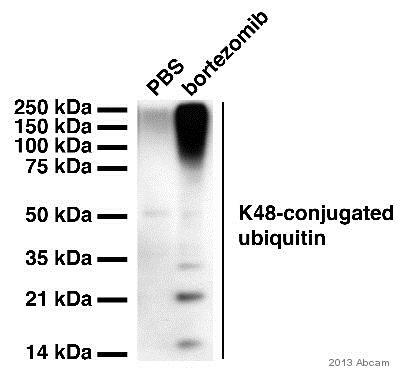 ab140601 only recognizes polyubiquitin chains formed by Lys-48 (K48) residue linkage. This antibody can detect the target in mouse and rat cell lines and induced tissues. 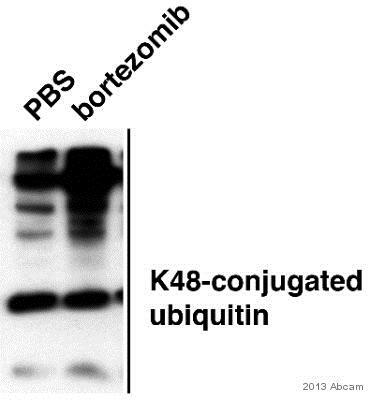 Synthetic peptide corresponding to residues in Human Polyubiquitin-C.
Our Abpromise guarantee covers the use of ab140601 in the following tested applications. Flow Cyt 1/20 - 1/1000. WB 1/200 - 1/10000. Detects a band of approximately 17-60 kDa (predicted molecular weight: 77 kDa). Blocking and diluting buffer: 5% NFDM/TBST. This image is produced useing purified ab140601. Purified ab140601 staining Ubiquitin (linkage-specific K48) in MCF7 (Human breast adenocarcinoma cell line) cells by ICC/IF (Immunocytochemistry/immunofluorescence). Cells were fixed with 4% Paraformaldehyde and permeabilized with 0.1% Triton X-100. Samples were incubated with primary antibody at a dilution of 1/500. 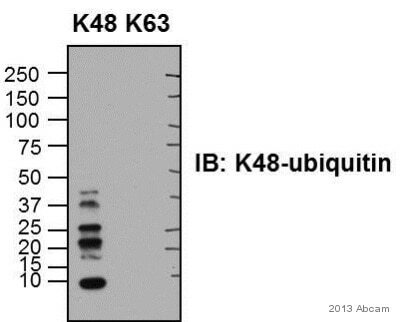 A goat anti rabbit IgG (Alexa Fluor® 488) (ab150077) was used as the secondary antibody at a dilution of 1/1000. ab195889 was used as a counterstain for primary antibody ab133645 at 1/2000. DAPI was used as a nuclear counterstain and PBS as a negative control. Purified ab140601 staining Ubiquitin (linkage-specific K48) in human endometrium carcinoma tissue sections by Immunohistochemistry (IHC-P - paraformaldehyde-fixed, paraffin-embedded sections). Tissue was fixed with paraformaldehyde and antigen retrieval was by heat mediation in a EDTA buffer. Samples were incubated with primary antibody at a dilution of 1/250. 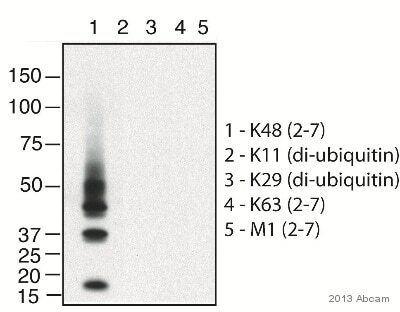 A goat anti-rabbit IgG H&L (HRP) ab97051 was used as the secondary antibody at a dilution of 1/500. ICC/IF image of ab140601 stained MCF-7 cells. The cells were 100% methanol fixed (5 min) and then incubated in 1%BSA / 10% normal goat serum / 0.3M glycine in 0.1% PBS-Tween for 1h to permeabilise the cells and block non-specific protein-protein interactions. The cells were then incubated with the antibody ab140601 at 10µg/ml overnight at +4°C. 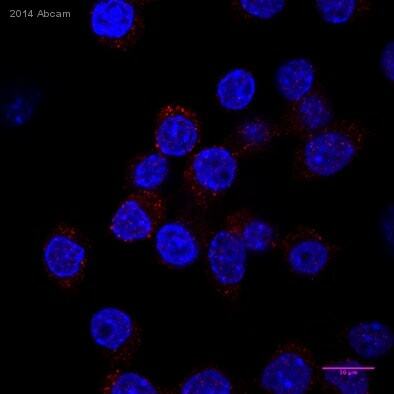 The secondary antibody (green) was DyLight® 488 goat anti- rabbit (ab96899) IgG (H+L) used at a 1/250 dilution for 1h. Alexa Fluor® 594 WGA was used to label plasma membranes (red) at a 1/200 dilution for 1h. DAPI was used to stain the cell nuclei (blue) at a concentration of 1.43µM. Overlay histogram showing HeLa cells stained with ab140601 (red line). The cells were fixed with 80% methanol (5 min) and then permeabilized with 0.1% PBS-Tween for 20 min. 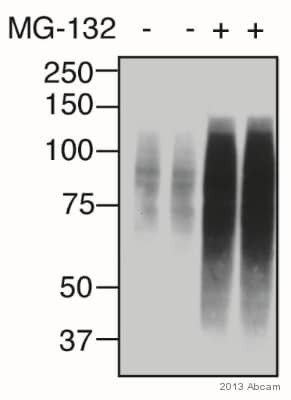 The cells were then incubated in 1x PBS / 10% normal goat serum / 0.3M glycine to block non-specific protein-protein interactions followed by the antibody (ab140601, 1/100 dilution) for 30 min at 22°C. The secondary antibody used was Alexa Fluor® 488 goat anti-rabbit IgG (H&L) (ab150077) at 1/2000 dilution for 30 min at 22°C. Isotype control antibody (black line) was rabbit IgG (monoclonal) (1μg/1x106 cells) used under the same conditions. Unlabelled sample (blue line) was also used as a control. Acquisition of >5,000 events were collected using a 20mW Argon ion laser (488nm) and 525/30 bandpass filter.